I am still awake from yesterday. I hurt so badly from repetitive motion and being bent over, but... it's done. My favorite part of finishing and looking back is to figure out what I would have done differently. First, I would have used a thinner wood instead of the thick stuff I did use. Two, I would have figured out a better method of attaching the shoulder straps. 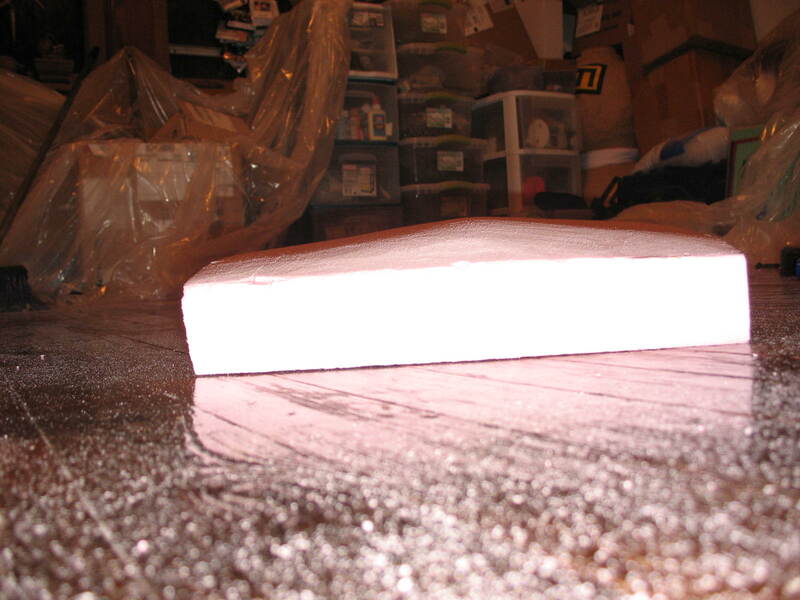 Three, thicker clear coat on the final foam. 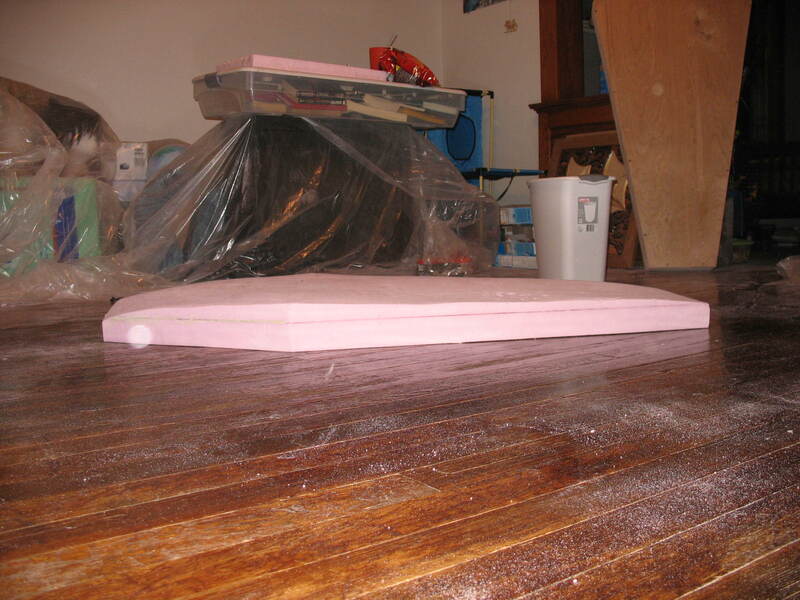 Four, finer sand paper on the foam near the end. Otherwise, I'm really pleased with how it turned out. Very true to life, and size. I believe this falls under the category of one of those anime props that's difficult to deal with IRL because of physics. So many things in anime are physically impossible, improbable, or would just be really clumsy (weapons in particular). Basically, it is sanded. That sounds really small, but this wood is really hard to sand. So yea that look a lot. All of the edges are nice and neat, lined up with each other, smooth to the touch. My current issue is that somehow the angles got messed up between the base and the lid, and the lid is SMALLER then the base. 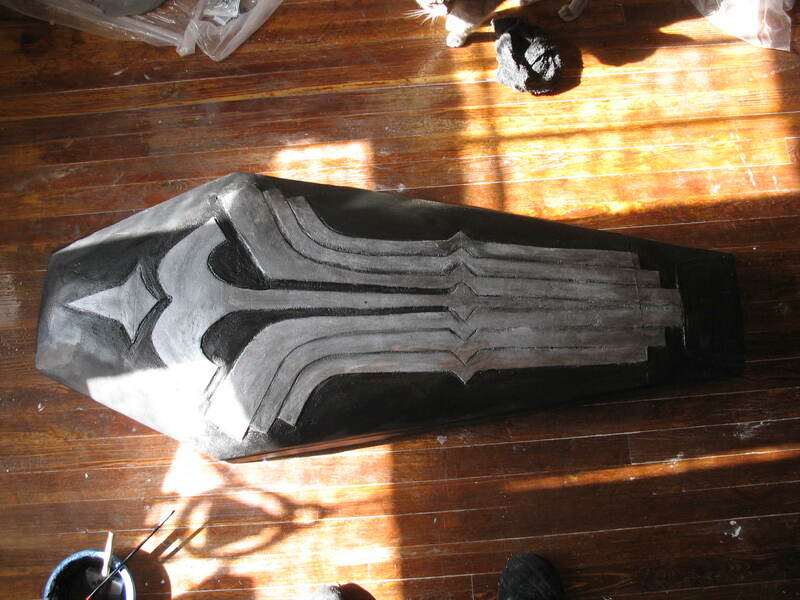 Basically I have to cut off large amounts of the sides of the base to get it so the whole thing is even. There are goods and bads about this. Obviously the bad is time. I'm gonna have to buy a bloody hand saw and just... go at it. Carefully saw off the parts I don't want, then sand them smooth again. Then I'll have to make sure everything lines up. Then I'll need to use wood glue to fill in any gaps in the wood between pieces and get that smooth. Oh um, the good part is that it'll cut off some of the weight. Not a lot, though, but some. 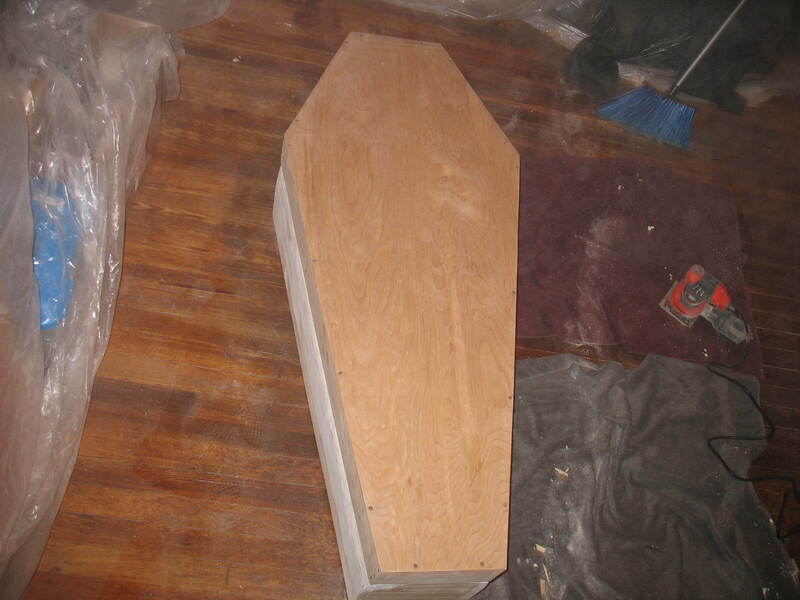 The hardest part will be over, I think, once the coffin is all the same size. 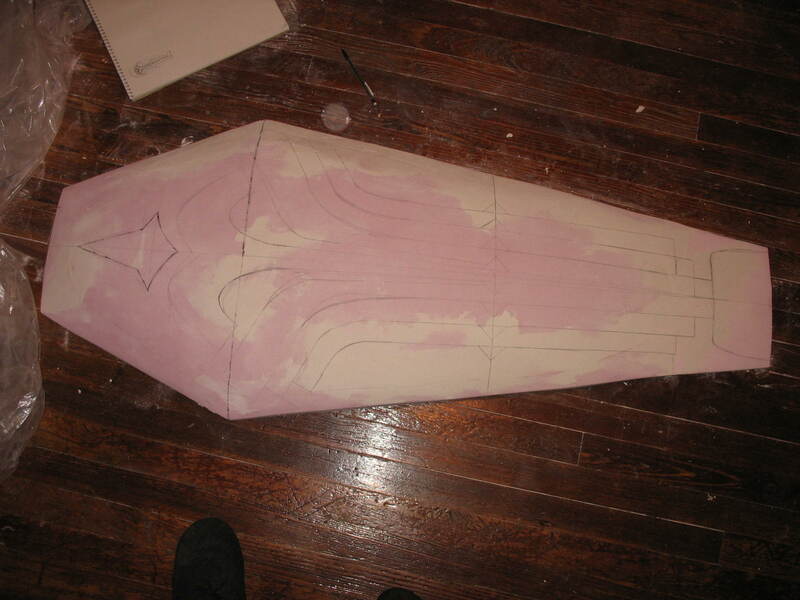 I'm going to work on the top 'domed/curved' part of the coffin between today and tomorrow. 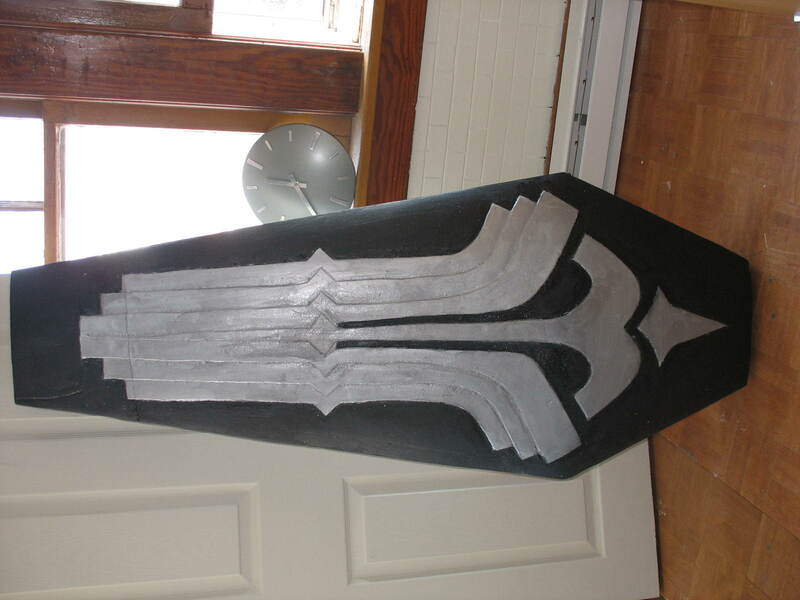 It's going to take two layers of foam sanded down into position and carved out. 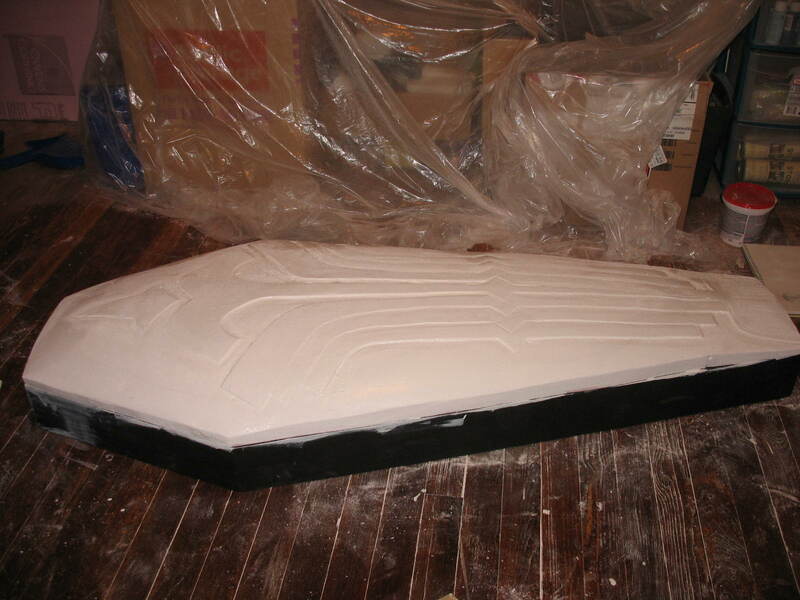 They I'm gonna have to gesso the foam, and then put the liquid plastic on top of the domed-foam part. I'm really nervous about this stuff, as its very difficult to use. 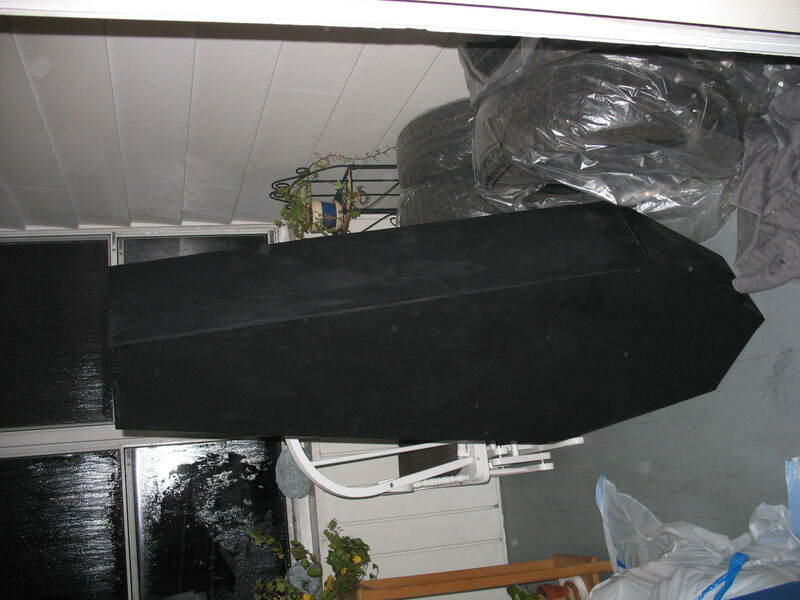 I hope I have enough of it... a gallon looks very small compared to a 5 foot long coffin. After that? Its ALL detail and painting. Going to carefully add molding to the edges of the case where lid and base meet. Have to sand the base's bottom to make it curve inwards a bit. Add the nail/screw/circles to the top. 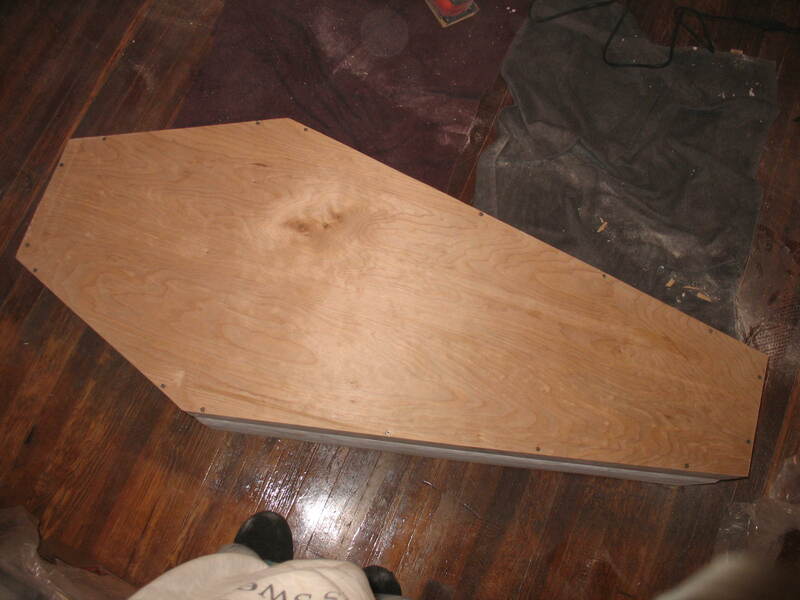 Add hinges and handles. Paint it black where needed, grey in others, metallic in others. After all of that (ha, shoot me)... it'll be done. Sigh. Whew! I almost freaked out when the base and lid ended up two sizes. And in the process of trying to fix it, I managed to crack one of the ends. I DID freak out then, but I tried to figure out what to do. Purely by accident... a chisel and hammer came into play. 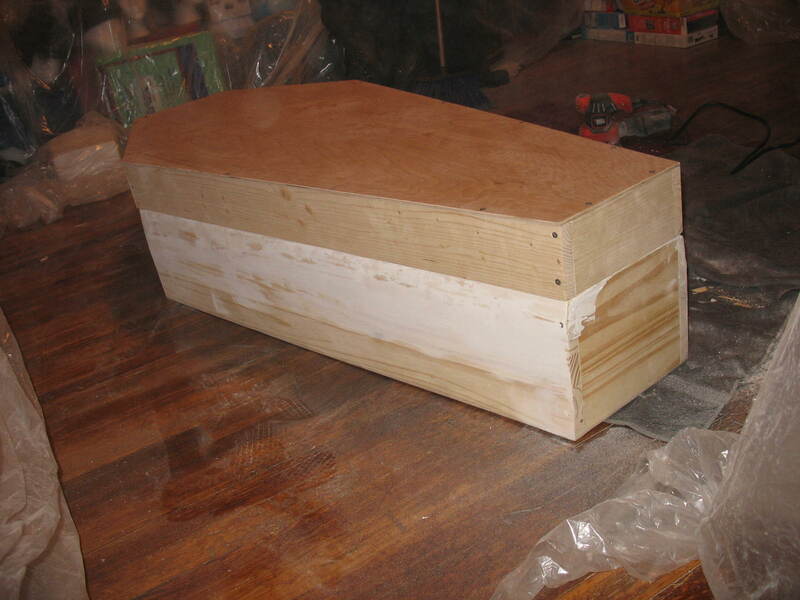 Finally I had a way to make the coffin lid and base the same size! 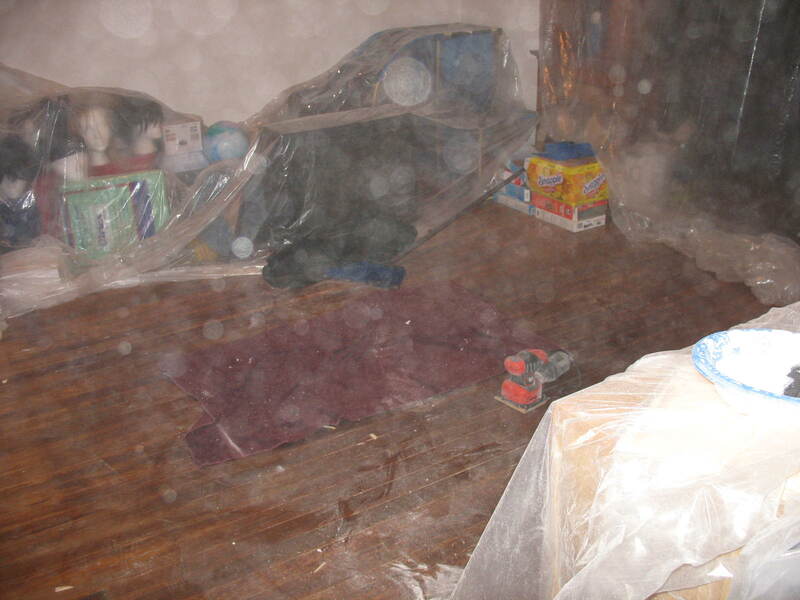 So that's why you see white stuff all over the base - its spackle, smoothing out any damage left behind by the chisel. A ton of sanding and chiseling later, top and bottom are the same size! 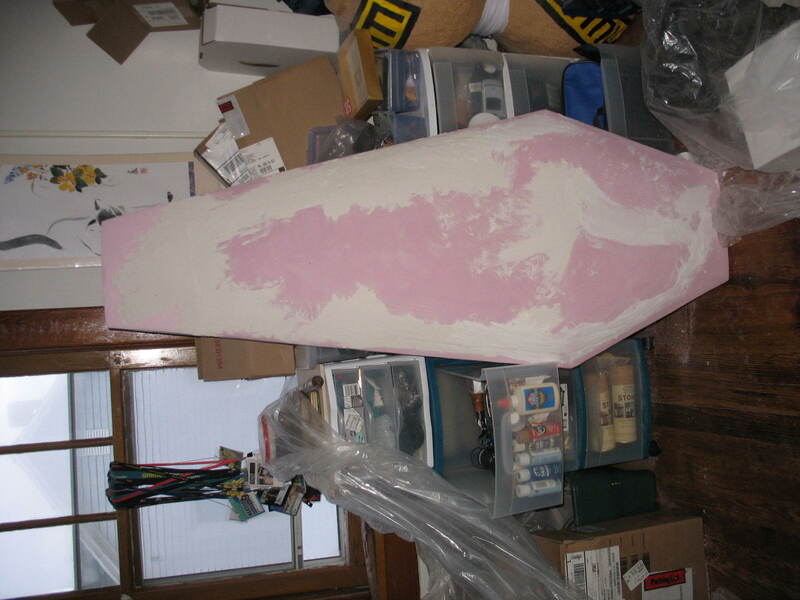 I am going to spend Wednesday night dealing with the foam top, making sure it has all the measurements marked into it so I can get it cut after work on Thursday. I can have the part of the wood I cracked re-done since I have leftover wood and I can get it into shape properly while I'm cutting the foam. I'll be having surgery on Friday, so I will be doing pretty much nothing this weekend because well I'll be drugged up against the pain. 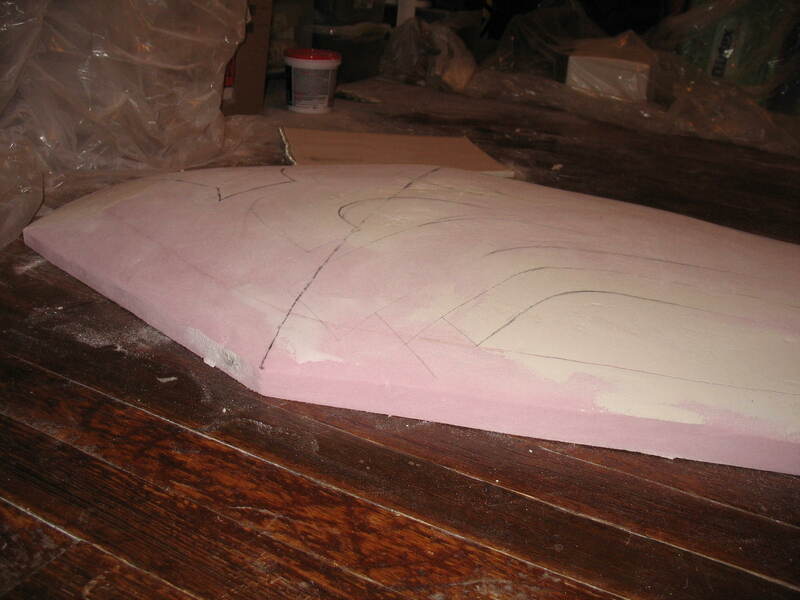 I'm going to carve out the design on the top of the foam between Tuesday and Wednesday, then glue it on and gesso it. 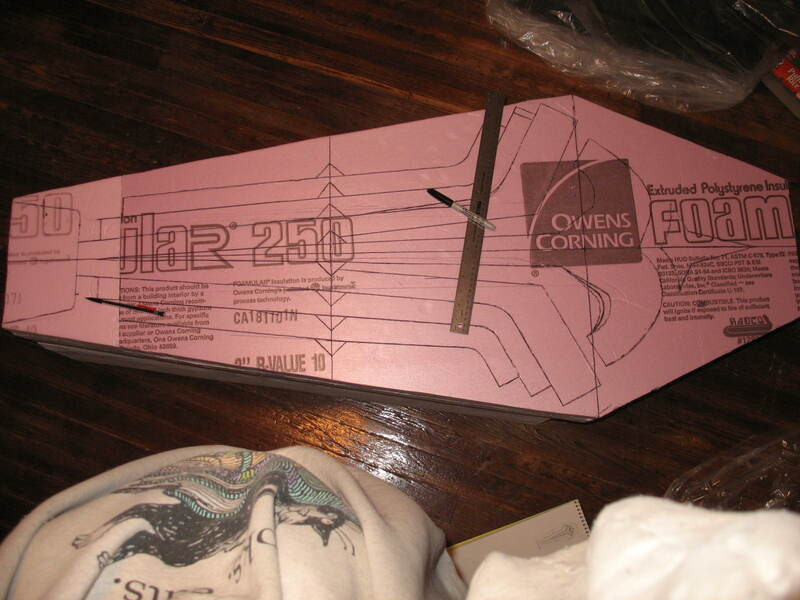 Hopefully I will have enough time on Wedneday night to put on the liquid plastic. If not, it'll be done the Sunday I arrive home. 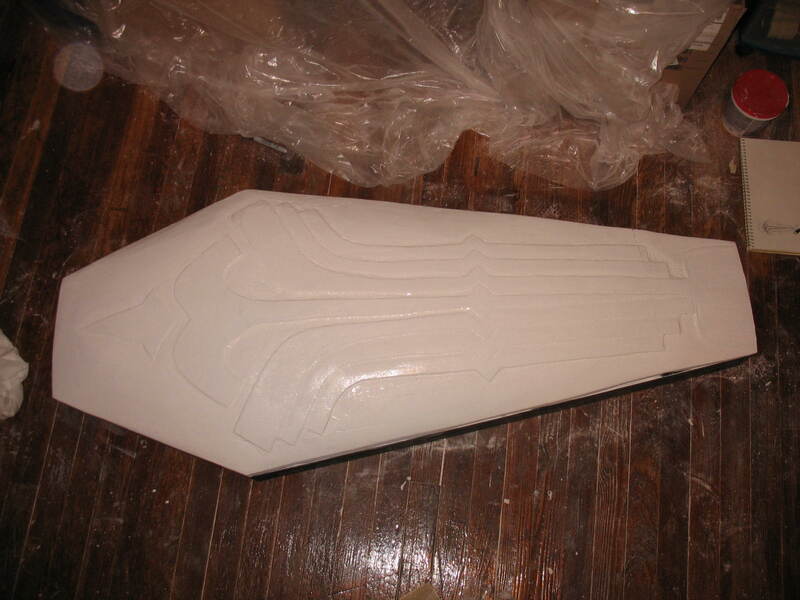 Tuesday'll be sanding down any issues with the plastic and giving everything its first layer of spray paint. Detailing on Wednesday and Thursday. Any final touch ups on Friday and packaging. It'll go out Saturday in the mail, with every intention of arriving by the 26th. As far as shipping goes. I am going to be hunting down boxes large enough to send this sucker in all week during my lunch hours. Its mostly based on the size of the box, so I'll make sure it isn't too big. Like I said when we'd started... this is gonna be a pricey ship due to the weight and sheer size of it. Its the biggest prop I've had to send to date.